LOUISVILLE, Miss. - Ruth Bennett died clutching the last child left at her day-care center as a tornado wiped the building off its foundation. A firefighter who came upon the body gently pulled the toddler from her arms. Bennett, 53, was among at least 35 people killed in a two-day outbreak of twisters and other violent weather that pulverized homes in half a dozen states from Iowa to Tennessee. The child's fate was not immediately known. Frightened residents in more than half a dozen states were forced to take cover, tens of thousands were left in the dark Tuesday, and crews in Mississippi and Alabama turned from search-and-rescue efforts to cleanup. Louisville was one of the hardest-hit areas, with officials reporting at least nine dead in and around town because of a powerful tornado with a preliminary rating of EF4, just shy of the top of the scale. Sennaphie Yates arrived at the small local hospital to check on her grandfather just ahead of the twister. As the funnel cloud closed in, staff members herded people into a hall. Bennett's day-care center was not far from the hospital. Her niece Tanisha Lockett had worked at Ruth's Child Care since it opened seven years ago. She said all but the one child - a 4-year-old girl who had been in the center's care since she was a baby - had been picked up before the storm. The child, whose name was not released, was taken to a Jackson hospital. Along Mississippi Highway 397 on the eastern edge of Louisville, firefighters picked through the remains of mobile homes. Twenty firefighters linked hands and waded through an area where wood frame homes had been heavily damaged. Rescue workers stepped gingerly over downed power lines and trees that were snapped in half and stripped of branches. Republican state Sen. Giles Ward huddled in a bathroom with his wife, four other family members and their dog as the tornado destroyed his two-story brick house in Louisville and flipped his son-in-law's SUV upside down onto the patio. "For about 30 seconds, it was unbelievable," Ward said. "It's about as awful as anything we've gone through." In Tupelo, a community of about 35,000 in northeastern Mississippi, every building in a two-block area was damaged, officials on the scene said. On Tuesday morning, a blanket of fog hung over the city. In one residential neighborhood, destroyed homes sat steps away from those left unscathed. Crews cleared trees tangled with power lines, fixed cracked roadway signs and removed debris from streets. In Kimberly, Ala., about 20 miles north of Birmingham, a suspected tornado hit at a crossroads before midnight Monday, tearing the A-shaped roof off the town's Church of God. On Tuesday morning, the roof sat in a solid piece beside the red brick church. Across the street, the cinderblock walls from an old fishing supply store were scattered around the gravel parking lot. The building's metal frame remained. Down the road, the fire department was flattened. Tim Armstrong picked up pieces of splintered trees in his backyard. Armstrong, his wife and their two young daughters were home when the storm struck. He said they were listening to weather reports on television and heard an all-clear for their area. "Three minutes later my mother-in-law calls, says there's a tornado in Morris," a nearby town, Armstrong said. "The power went out, and we went running to the middle of the house." They heard the wind roaring and glass shattering as a tree flew through their front door. "Once I heard that, I knew something was pretty wrong. It was fast. It was so fast." The whole thing was over a minute later, he said. Among those killed in Alabama was 21-year-old University of Alabama swimmer and dean's list student John Servati, who was taking shelter in the basement of a Tuscaloosa home when a retaining wall collapsed on him. The threat of dangerous weather jangled nerves a day after the third anniversary of a historic outbreak of more than 60 tornadoes that killed more than 250 people across Alabama on April 27, 2011. In southern Tennessee, two people were killed in a home when a suspected tornado hit Monday night, Lincoln County Emergency Management Director Mike Hall said. The winds destroyed several other homes as well as a middle school in the county that borders Alabama, Hall said. The storm system is the latest onslaught of severe weather a day after a half-mile-wide tornado carved an 80-mile path of destruction through the suburbs of Little Rock, Ark., killing at least 15. 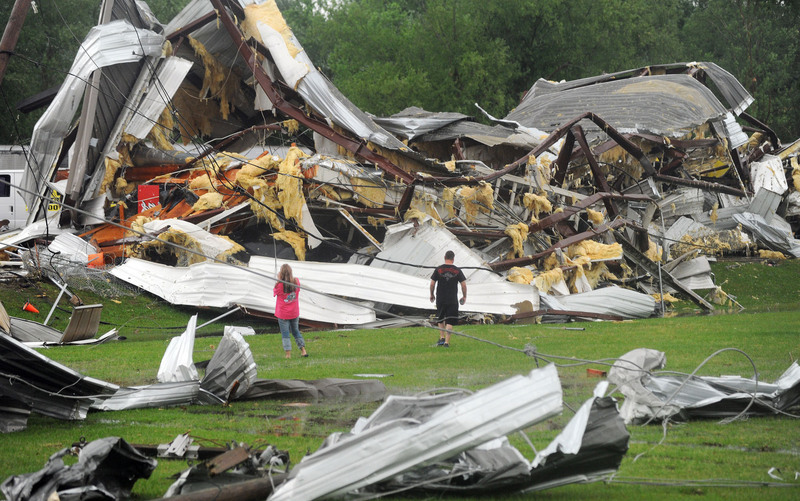 Tornadoes or severe storms also killed one person each in Oklahoma and Iowa on Sunday. In Arkansas, storm survivors joined first responders in a desperate attempt to rescue neighbors. Pickup trucks became ambulances. Pieces of plywood became stretchers. "I knew they had to be helped, and I knew they were friends of mine," Nick Naylor said.